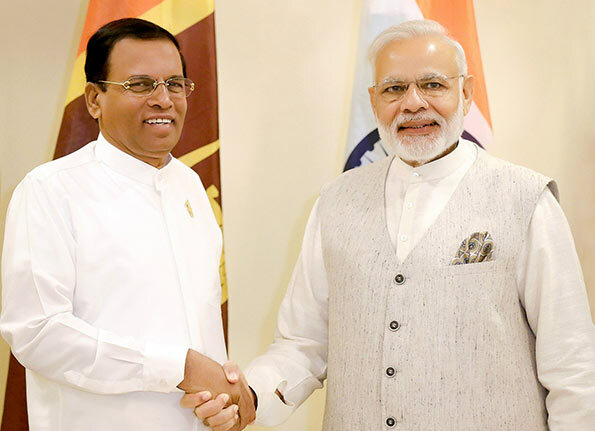 President Maithripala Sirisena who is in India to participate BRICS Outreach Summit held bilateral discussion with the Indian Premier Narendra Modi at the Taj Exotica Hotel in Goa yesterday (Oct. 16). Prime Minister Modi who warmly welcomed President Sirisena stated that the President’s participation to the BRICS Outreach Summit is a great strength for him, for India and also for the entire BIMSTEC region. He further stated that Sri Lanka has a significant role in the South Asian Region at the moment. “I invite Sri Lanka for a deep relationship beyond the agreements and regulations”, he said. President Sirisena thanked the Indian Premier for his invitation for the BRICS Outreach Summit. “This strengthens the long friendship between Sri Lanka and India”, he stated. He also recalled the India’s assistance, provided to Sri Lanka whenever the country has been in difficult situations. When the country was in difficult circumstances, the Indian Govt lead by the late Indira Gandhi provided training and arms to the LTTE. Is this what the President is recalling? Great shaking hands with PM Modi. The Yahapalana Bribery Commissioner has resigned her post today in a stunning message to the Yahapalana Government under the leadership of HE MY3Pala Sirisena. This clearly shows that the two major Sinhala Buddhist political parties are unable to govern the pretentious United Nation of Sri Lanka. It is time for division and the creation of the two states in the island.